DM1 lets you explore the store like never before. All customers are not the same. New shoppers. Loyal shoppers. Leisurely browsers on weekends. Focused weekday evening shoppers. Clearance shoppers. Brand buyers. They’re all distinct. Each has different needs, challenges and opportunities. 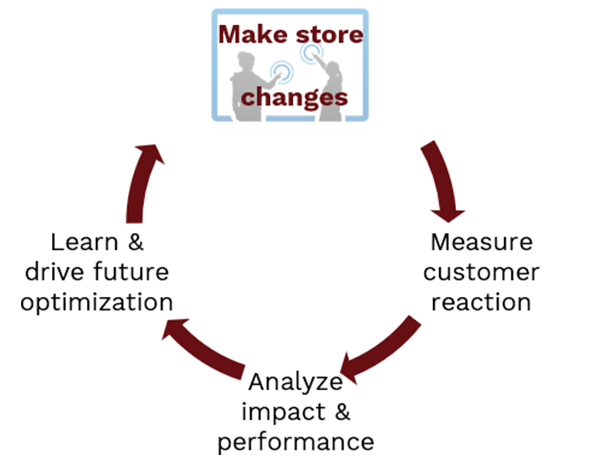 DM1 gives you the ability to easily see the store in aggregate or isolate specific customer types. Now analyze those shopper journeys step-by-step. Where do you lose shoppers? Do interactions drive sales? Are cross-sells a distraction? 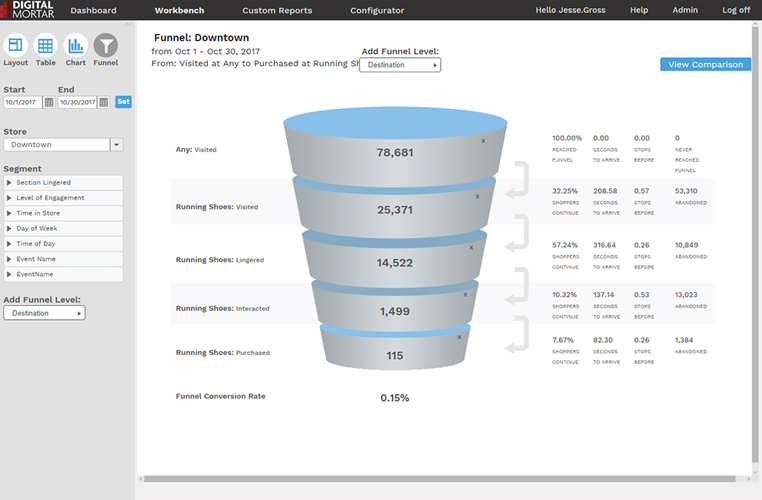 Funnel analysis lets you ask and answer the questions that drive store optimization. DM1’s funnel tool lets you measure every step of the way for every aspect of the store to optimize each customer journey. 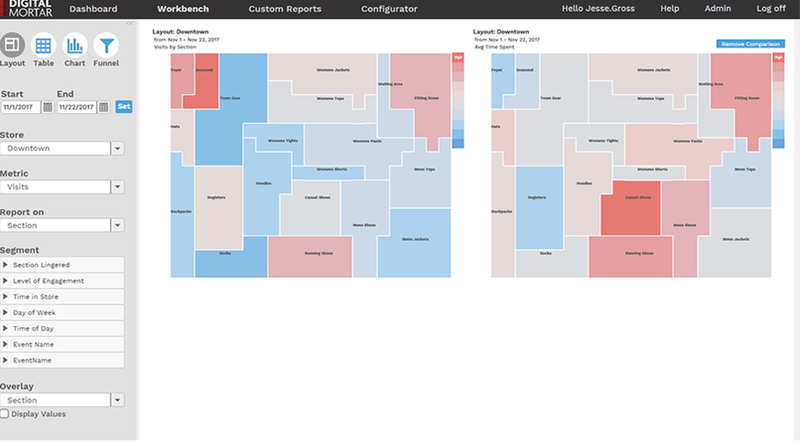 Across every DM1 reporting view. Continuous improvement is the secret to driving business value. It’s what made great digital companies such formidable competitors. They measure everything. They test everything. They get better every day. Now you can too. 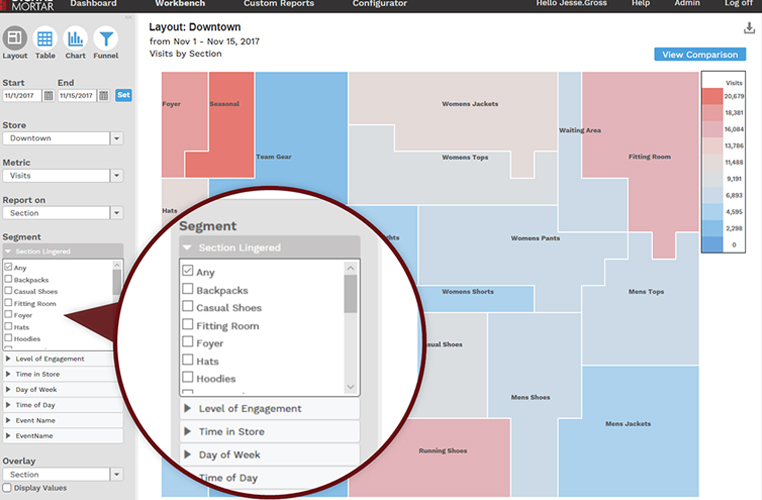 DM1 gives you the measurement you need to optimize store layout, store merchandising, customer campaigns, and associate performance. Every aspect of the store/customer journey measured...so it can be improved. Will Digital Mortar help analyze the data? Sure. We have decades of experience in enterprise-level professional services focused on driving effective analytics. If you need support we’re happy to help and most DM1 PoC’s embed at least one analytic project. If you need continuing on-site support, we can recommend one of our agency partners – with deep expertise in everything from omni-channel optimization to customer life-time value to staff forecasting. What are some of the key analytics projects that drive value.. Does DM1 do Predictive Analytics? Not really. If you need machine learning or modelling, you can use DM1’s event-level, cleaned data feed to access the data in the tool and system of your choice. And if you need help handling that data or integrating it, we have some great partners like Syntasa and Capgemini that provide the necessary technology and the right expertise.